Queries for term “Black Friday deals” increases significantly much earlier than the exact day and you should be in the best position to tap that opportunity. Start displaying offers on your homepage to attract people who are searching for the deals. Ensure that your online store is ready to handle both demand and supply. Your website should be capable of handling a surge in traffic, and you should have enough inventory to fulfill all the orders. You can also analyze your previous year sale data and can forecast your sale numbers for this year. This forecast will help you to prepare enough inventory for the increased demand. After setting up your store, it is crucial to communicate your store deals in a right way. Create some original posts to display your offers & deals. Create urgency or buzz about the deals you are offering. Post the teasers of your offers on social media or your website. You can try a ticking clock or a countdown to show the remaining days for the Black Friday deals. You can also run some special offers for your loyal customers. It’s not necessary that every person who is visiting your website would eventually turn into a customer. According to Barilliance, 64% people abandoned their cart during the period from Black Friday to Cyber Monday. These website visitors can play a significant role in boosting your conversion rate. These are the people who visit your website, like a product, add that in the cart and do not check out. You can target them by sending compelling emails. You can try to bring them back to your website. In Shopify app store, there are some great abandoned cart apps which can help you to win the lost customers again. As people are shifting to the mobile devices for shopping online, optimizing your online store for mobile devices is the need of the hour. If your website is mobile optimized, it is likely to get good SEO ranking and will deliver an exceptional customer experience. So, tune your online store for mobile users and boost your conversions. What is the benefit of running amazing offers if nobody knows about it? So, the right marketing strategy will help you to communicate your Black Friday deals effectively. You can use Facebook Advertising, Email marketing, Google Ads or content marketing to generate the sale. If you are targeting existing customers then sending a fantastic email would be the best way. If your store has launched some specific offers for your loyal customers, then you can convey the same in your email and target your existing customers. 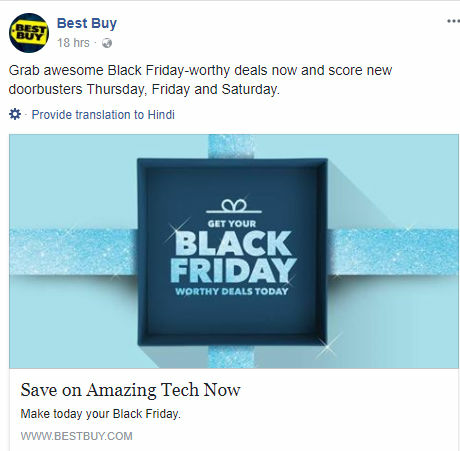 A Facebook Post by Bestbuy.com displaying Black Friday Sale. To acquire new customers, you can start writing blogs targeting black Friday or Black Friday deals at least a month earlier. Also, posting different types of creatives on your social media pages can attract a lot of people. You can even run retargeting ads to target the people who have interacted with your store products but didn’t take the conversion action. Google AdWords can also prove a powerful tool to capture the right audience as you can search, display or product listing ads targeting your potential customers. To get success in AdWords, always consider using the right set of keywords and having a good quality score. On the day of this grand sale, it is essential to provide an excellent customer service to your customers. Many customers might want to get in touch with you to get their queries solved. So, establish a quick turnaround time. Provide instant help to your website users. You can integrate a live chat option in your store. This would provide a more comfortable way for your users to post their queries or doubts. Also, make sure that you provide instant response to the email queries and the phone calls. Do not keep your customers on waiting line if they call your support number. Have adequate resources to handle an increased number of queries. It matters a lot when customers buy online as their buying decision purely depends on the product description, customer reviews, images and the trust factor. A robust return policy or money back guarantee makes life easy for a customer, in case they receive a damaged product or a false one. Your return policy should be very clear and convenient. Mention all the terms & conditions clearly on your product page. This will build trust with users and encourage them to pull out their cards. Make sure that you are tracking all essential metrics in your store. Keep an eye on all numbers and always know what’s working for your online store. Get useful insights using Google Analytics and other tracking tools. This data will help you to analyze the performance of your store in this holiday season. Calculate your sale numbers and conversion rate to get a clear picture. You can then improve your strategy for the next year’s holiday sale. “Hope for the best and be ready for the worst.” This proverb perfectly fits in this scenario. You should always have a backup plan. What happens if your shipping partner is overloaded with the orders and can not process your request? Is there any alternative if your website goes down? The moral is to be prepared for all the wrong situations as well. Have a clear communication with your shipping partner that you are going to put up a sale and you are expecting a hike in the orders. Also, ask your developers to be ready at any time for any task during this sale. To get a successful Black Friday, start optimizing your online store earlier and prepare the right strategy. Promote your offers creatively and focus on delivering an exceptional customer experience. Track your results and learn from your experience to improve your store performance next year. Stay connected to ImageKit for more tips & tricks.